Manali-Rohtang pass-Batal-Kunzum Pass-Kaza-Pin Valley-Tabo-Dhankar Monastery-Langza-Comic-Kibber-Chanderatal lake-Manali and drive back to Chandigarh. The views of the high altitude desert, precipitous valleys, beautiful mountain , the Himalayan wildlife, the glaciers, high passes, beautiful lakes, rich traditions, Camping at Chandratal Lake is an experience one will never forget after a visit to the Manali Spiti Pin valley tour. The Manali Spiti tour Package is a combination of Kullu Manali tour , Spiti valley tour and Pin valley tour across the two high mountain passes of Rohtang pass and Kunzum pass. It is a summer tour package to Manali with Chanderatal Lake tour for spending a short vacation in Himalayan Mountains of Spiti valley — deserted mountain valley located high in the Indian Himalayas. Spiti valley is also known as the Cold Desert of The Indian Himalayas, as the valley remains cut off from the rest of the world for the six months due to heavy snow. The valley is similar to valleys in Tibet and Ladakh, and it is more beautiful than those due to ever changing landscapes after every couple of kilometres. Spiti Manali tour package is also the part of tribal circuit tour and can also be combined with Kalpa Sangla tour finishing at Shimla at the end. On your arrival at Chandigarh railway station / airport you will be met by our driver and he will drive you to Mandi on the way to Manali. We will stop for lunch break and various picture and comfort breaks on the way to Mandi. The journey from Chandigarh to Manali is around 290 kms ( 11 hrs), so to give you a break we will stop at Mandi on our first day of the tour journey. Overnight stay in Mandi in a hotel or you can choose to stay in a home stay with a local family in village Panjgain, where you can experience the village life. ** Please ask us for more details regarding the village home stay tour in Panjgain village near Mandi/ Bilaspur. Day 02	: Mandi to Manali 2,050 metres / 6,726 feet (110 kms / 6 hrs). Today after Breakfast we will drive you to Manali via , Pandoh Dam, Aut, Kullu . The route from Mandi to Manali is full of scenic beauty and we will stop for various comfort breaks and picture breaks of waterfalls, rivers, and traditional wooden bridges across the Beas River. We will stop at Pandoh Dam, Hanogi devi temple and if interested you can also visit the Shawl weaving factories and the Vaishno devi temple at Kullu. We will arrive Manali by late afternoon. 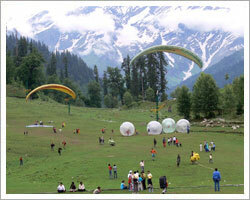 Overnight stay in hotel in Manali and evening is free to explore the local market of Manali and old Manali. Day 03	: Manali to Kaza 3,200 metres / 10,500 feet ( 205 kms / 10 hrs). Today we will make an early start ( 07: 30 A.M) as it is the longest day’s journey driving to Kaza (9-10 hrs). Today we will first cross the Rohtang pass (3,980 metres / 13058 feet) and enter Lahaul Spiti valley. We will stop for various photo stops to the rohtaang pass and will stop for lunch break at Chatru. Later we continue our drive to kaza over Kunzum pass, 4,558 metres / 14,950 feet). We will visit the temple on the Kunzum Pass where travellers say prayers before heading down the pass. The Kunzum Pass provides beautiful views of CB ranges and Glaciers. 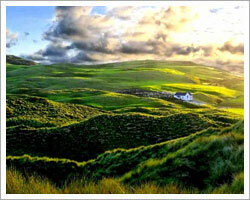 Today you will experience the ever-changing landscapes after, every couple of kilometers. We will arrive Kaza – the administrative headquarters of Spiti valley by evening. Overnight stay in hotel in Kaza. Day 04	: Sight seeing around Kaza ( 5-6 hrs). Today after breakfast we will be driven to the village of Lagnza. Here there is an opportunity to walk around the village with your guide. You may wish to visit the monastery at the top of the village and on the way look out for fossils. Here you can also see the yak working in the fields or yak grazing in the pastures. We will continue our drive to Hikkim, and the Comic village, which is now the world’s highest village (4,450 metres) joined to a motorable road. Later on for the lunch we will drive you baack to kaza by afternoon. Rest of the time would be free to explore the local market of Kaza. Second night in the same hotel in kaza. Later we will continue our drive to Kee Monastery and the village of Kibber. Once Kibber (at 4,200 metres) was considered the world’s highest village. There is also the option to walk to the nearby mountains where there are big herds of Himalayan blue sheep and snow ibex gather in the evening. Lunch will be at Kibber village, in a local restaurant, where you will be offered a choice of delicious Tibetan dishes. In the evening we will return to Kaza for a second night at the hotel. Day 05	: Kaza to Pin Valley and further to Tabo 3,050 metres /10,007 feet. Today after breakfast we will drive you to Pin valley tour — the land of Ibex and Snow Leopards. We will Visit Kungri monastery at Pin Valley and later c our ontinue drive to Tabo. We will arrive tabo by late afternoon. On arrival we will check into the hotel and later we will visit the famos Tabo monastery oldest in the Himalayas, founded in 996 AD . Tabo monastery is renowned for its breathtaking murals and stucco images – and is often called “The Ajanta of the Himalayas”. The largest monastic complex in Spiti, the old section has 9 temples, 23 chortens, a monks chamber and a nuns chamber. There are several caves adorned with frescoes and contemporary structures too. In trans Himalayan Buddhism, Tabo’s sanctity is next only to Tibet’s Tholing gompa. Overnight at Tabo. Day 06	: Tabo to Dhankar and Further to Kibber 4,200 metres / 13,780 feet. 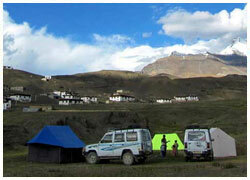 Today after breakfast we will drive you to Dhankar village and monastery. After visiting the dhanker monastery we will continue our drive to Kibber village via kaza and enroute we will visit to Kee Monastery. Key monastery is one of the biggest monasteries of Spiti and presents the beautiful views of the Rangrik Plains and the villages and the Spiti river and valley below. Later we continue our drive to Kibber village (at 4,200 metres / 13,780 feet). There is also the option to walk to the nearby mountains where there are big herds of Himalayan blue sheep and snow ibex gather in the evening. Overnight stay in Guest House in Kibber. Today early morning we will drive you to Chanderatal Lake over Kunzum pass. We will stop for breakfast at Losar . If the road is open to the Lake we will drive you near the Lake and you will have to walk the last 1 kms on foot to visit the beautiful Chanderatal lake. 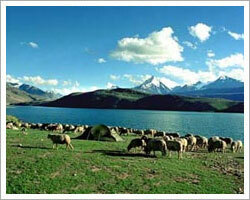 Overnight stay near the lake in basic tented accommodation or in temporary accommodation at Batal. We will arrive Chanderatal lake by late afternoon and rest of the time is to enjoy the scenic views of The Chanderatal Lake with the Himalayan backdrops. Day 08	: Chanderatal lake to Manali 2,050 metres / 6,726 feet (120 kms / 6 hrs). Today after breakfast we will continue our drive to Manali Over Rohtang pass. We will arrive Manali by late afternoon. Rest of the time is free to explore the local market of Manali. Overnight stay in hotel in Manali. Day 09	: Manali to Chandigarh ( 290 kms – 11 hrs). Today after breakfast we will drive you to Chandigarh via Kullu, Aut, Hanogi devi temple and Pandoh Dam. If interested we will stop you at the shawl weaving factory at Kullu for 1-2 hrs for the shopping or you can also go for river rafting on Beas river. Later on we will continue our drive to Chandigarh. En route we will also visit Hanogi Devi Temple, Pandoh Dam and will stop at Sundernagar for the lunch Break. We will arrive Chandigarh by evening, where you will stay overnight in a hotel. Day 10	: Fly back to your place.